Wiz Khalifa and Amber Rose are back together even though just a few weeks ago they hated each other. The couple spent Easter together egg hunting with their 2-year-old son Sebastian Thomaz. Wiz and Amber spent some quality time together at Tamar Braxton’s Easter party in Calabasas last weekend. Sources told Urban Islandz that the are full on a couple again and are trying to make it work for their 2-year-old son. “Wiz Khalifa and Amber Rose deeply love each other and like a lot of couples they just had a rough patch but they are back together and has been inseparable since,” our source said. 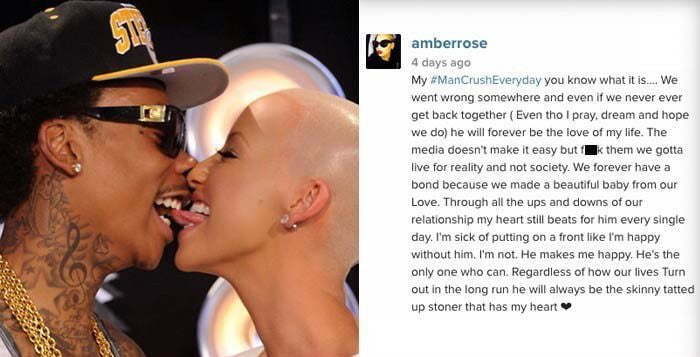 Last week Amber Rose professed her love for Wiz Khalifa on Instagram in a heartfelt caption on a photo of the two love birds kissing. “We went wrong somewhere and even if we never ever get back together ( Even tho I pray, dream and hope we do) he will forever be the love of my life. The media doesn’t make it easy but f*** them we gotta live for reality and not society. We forever have a bond because we made a beautiful baby from our Love,” she wrote. Amber Rose and Wiz Khalifa split last September and the blonde bombshell filed for divorce. The couple was also embroiled in a bitter custody war only a few weeks ago but seems that is all water under the bridge now.